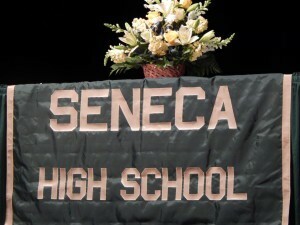 The event will be held on Thursday, April 14 at 6:30 p.m. in the Seneca High School Cafeteria. Sponsored by the Seneca Parents Group, all proceeds will help to fund “110 Carranza Prom House,” an alcohol and drug free post prom party to be held at Seneca. There will be 10 games of bingo played, and a bag or wallet will be given as a prize for each game. There will be a fee of $20 per player if registration is received by April 6th, $25 after and at the door to play. Participants must be 18 or older to play. Additional cards may be purchased at the door. Those are interested may reserve a table of 6–12 seats, paid in full. Doors will open at 6:15pm and refreshments and Bingo Daubers will be available for purchase.